If you follow me on Twitter, you probably noticed a heightened volume of Tweets from me during the RSA Conference in San Francisco. It was great catching up with many of you based stateside that I rarely get to see in person. I was also fortunate enough to be allowed to attend sessions and live-Tweeted the ones that were interesting. Therefore, I'm not going to regurgitate/organise my Tweets into thoughts here. I will however, highlight a few key points that I felt were important. 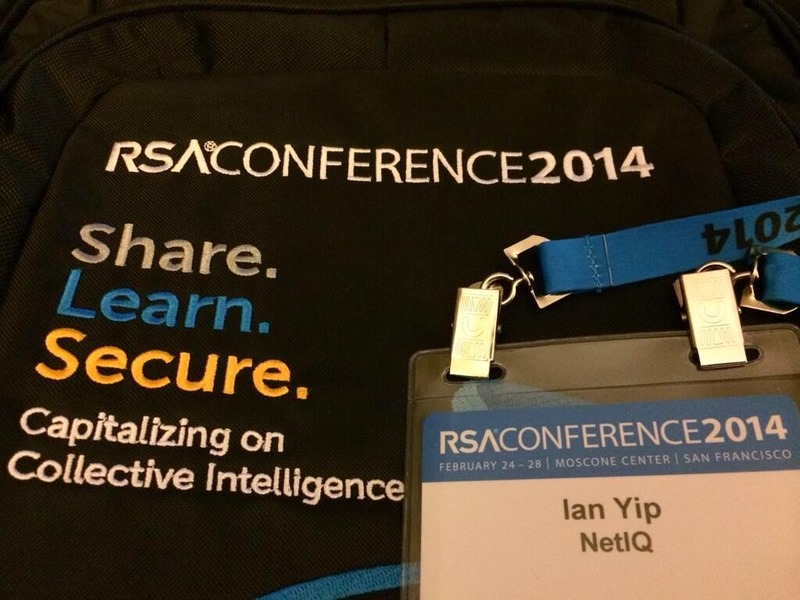 This was an RSA conference where everyone was talking about the NSA. First, there were the well-publicised boycotts from speakers. Then came the competing conference. Then there were the protesters. RSA Chairman Art Coviello opened the conference and addressed it up front (right after William Shatner's song and dance). Stephen Colbert closed the conference with an NSA-heavy keynote (incidentally, he was hilarious). And in a show of courage or stupidity depending on your perspective, the NSA even had a booth on the expo floor. There were many stories written about this during the conference, so just use your search engine of choice. But if you don't feel like searching, check out the New York Times' Nicole Perlroth and her blog post detailing some of the NSA-focused activities. My Tweet stream was also relatively NSA-heavy, so go check that out too. We assumed everyone knew we do the whole electronic surveillance thing. We didn't know it would be such a big deal and we're sorry, but we have to do it. And by the way, better it be the US Government than some foreign hostile nation. They're all just pissed that we're so much better at it than everyone else. We must work on collecting only what we need instead of absolutely everything. But if you've ever tried to do this, you know it's easier to collect everything instead of being selective. We, the US Government, want to work more closely and cooperatively with US companies on making the Internet, technology and the real world safer for all. How do we make life more difficult for governments to spy on us? Encryption. Sure, governments have quantum computers working at cracking encryption measures, but they really don't like having to do it. It was a topic of discussion during the cryptographer's panel and made in relation to the NSA. 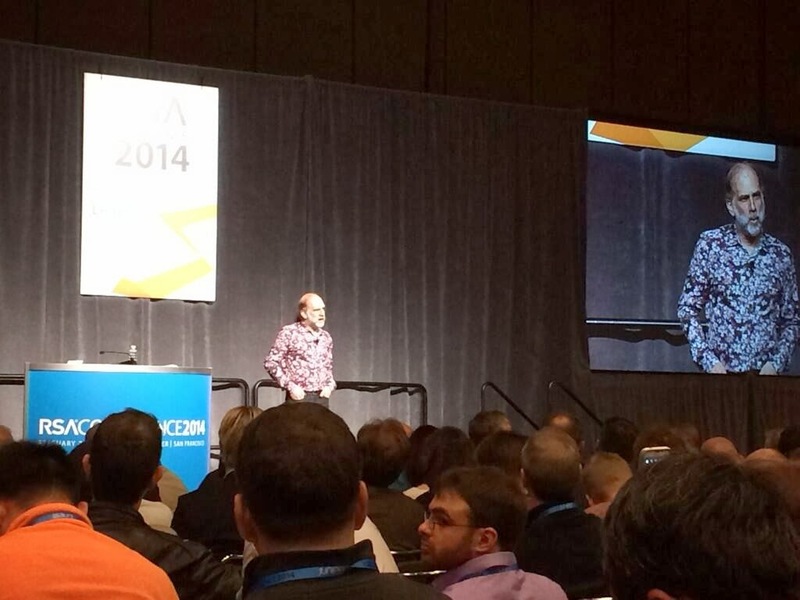 Bruce Schneier has mentioned it on many occasions and reiterated his sentiments during his session at the conference. I said it in my IT security predictions for 2014 and I've mentioned it on television. Start with encryption. It won't fix all your security issues, but it's a good start and a good countermeasure for issues beyond the NSA and government spying. Despite the fact that Snowden's been the poster child for the fact that privileged users can do a lot of damage, there wasn't a great deal of noise (compared to the NSA and government spying), except in sessions relating to industrial control systems. In every session I attended where industrial control systems were a topic of interest, privileged users came up as a primary focus area. Often, industrial control systems are tied to users directories (usually Active Directory) and most attacks simply aim to compromise an account within the directory. Once compromised, an attacker will escalate privileges until they have sufficient access. In other words, the more "administrative" the account, the quicker the compromise. In short, at the very least, organisations must secure and monitor privileged accounts in directories and operating systems. You didn't need to attend the conference to know IoT is big in 2014. While I don't believe many are doing anything in terms of IoT, I don't discount the fact everyone wants to talk about it. It became clear in listening to some IoT-focused sessions that the biggest challenge in securing the IoT at the moment lies with the ignorance and complacency in the manufacturing process, particularly with device manufacturers. Far too many do not implement (or care about) basic security practices in delivering a product. Many use default settings, which are often insecure. In addition, they often reuse the same insecure software components in updated versions. Beyond this, there is difficulty patching existing devices, particularly in trying to figure out how to do this without user intervention. We can't even get this right for existing computing devices. How are we expected to get it right for devices with in-built computers most are not aware of and cannot access easily through a usable interface? This is why it's relatively easy to hack cars. Applies to all organisations that turn over more than $3 million per year and collect personal data. Fines up to $1.7 million for breaches. Organisations must be transparent about how they collect, use and store personal data. Organisations cannot collect data “just in case they need it”. If personal data is disclosed to a 3rd party, the organisation disclosing the data is responsible for ensuring the 3rd party understands their obligation and that the consumer knows about the disclosure. This effectively gives the Office of the Australian Information Commissioner (OAIC) teeth as the fines are now significant when compared to previous legislation. For example, Australian Telecommunications giant Telstra has only been fined a measly $10,200 AUD for their recent violation. The days of "we'll ask for the information in case we need it" are gone. Organisations need to think about what they really need to achieve the task at hand and collect only what they need. As consumers, we should be able to sign up for online services in a shorter amount of time instead of frustratingly getting stuck on a submission form which constantly complains we haven't filled in certain fields. Marketing programs and processes need to be reviewed to ensure personal data is not being inappropriately shared with 3rd parties. Many companies disregard the flow of information and the lack of visibility & understanding around how this is done, sometimes through no fault of their own. The number of technology integration points involved is challenging, but as privacy is now tied to financial penalties, this is a huge risk to businesses and should be addressed urgently through the involvement of IT departments and potentially external assistance. If information is justifiably shared outside of the organisation, they will need to have the ability to determine if an overseas 3rd party they are disclosing personal information to also complies with the privacy act. This is a function many organisations will not have and will need to be included as part of their risk management program. In all things privacy-related, things tend to be up for debate, none more so than the term "personal information". The safest way for organisations to tackle this ambiguity is to assume data can be tied together from various sources, even when not immediately obvious as to how, to form context that can be tied to an individual. For example, an IP address is a potential identifier of an individual when combined with information from the relevant Internet service provider. Personal data can also be stored in unexpected locations that organisations may be unaware of, the most obvious being application logs. IT departments need to perform an internal audit of the information applications use and ensure they are not subject to inadvertent personal data leakage through logs as a result of log file settings. There is also additional administrative overhead in dealing with personal information and its access. The right technologies and a properly implemented reliance on external information providers can help. For example, power can be given to individuals to have complete control over the information stored about them through self-service portals. In addition, there may not be a need to store certain pieces of information. Standards exist (e.g. pick your favourite federated identity standard) that allow a relying party requiring information about an individual to ask for it from an identity (or attribute) provider and use it in flight without having to store the information on disk. Beyond the more mature federated identity standards, there are emerging ones such as User Managed Access (UMA) that place more power in the hands of consumers (i.e. the rightful owners of the data). While not yet supported in many technology stacks, the concepts are sound and organisations would do well to adopt the thinking behind what UMA is attempting to achieve in the longer run. Australian organisations need to treat personal data like they would financial information. For example, there are a raft of measures dictated by the PCI-DSS standard regarding the storage and usage of credit card numbers. While the number of credit card data breaches have proven PCI-DSS alone does not prevent breaches, existing data protection standards are a good start for organisation struggling to deal with the implications of the new privacy principles. Organisations would do well to adopt many of the same measures dictated by security standards in protecting personal data as a start. As they understand the requirements and data flows over time, more sophisticated security and access management measures can be implemented to round out an evolving security program.